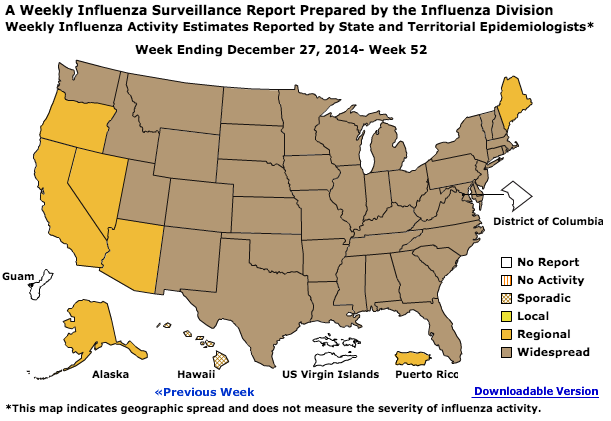 The annual influenza outbreak has reached widespread levels in 43 states – up from 36 states a week ago. That the flu has reached epidemic status is not unexpected — this is a regular part of flu season — but it has reached epidemic levels somewhat earlier than it usually does. The last two flu seasons were declared to be epidemics in mid-January. This season is looking particularly bad because the predominant strain, H3N2, is not completely covered by the current flu vaccine and tends to have more severe symptoms. H3N2 accounted for the majority of the strains tested by the CDC so far this season, according to a health advisory issued in early December. A network of labs working around the world is always on the lookout for new and emerging viruses year-round. These viruses are then tested against human blood serum; the ones that provoke the least immune response are the ones that are most novel and dangerous to the population. But flu viruses naturally mutate, which is, after all, why we have to formulate a new flu vaccine each year. This year, the H3N2 virus mutated faster than usual, so the vaccine we now have is less effective against the H3N2 virus that is circulating most widely. The new H3N2 was first detected in March of 2014, and it became common by September. And now it’s too late to add it to this year’s flu vaccines altogether, thanks to the decades-old process we use to create vaccines in the first place. 25,000 to 40,000 people a year die of influenza—the vast majority of them unvaccinated. A simple halving of the number with today’s mediocre vaccine would represent a major public-health triumph. By way of comparison, about 14,000 people in the U.S. died of AIDS in 2011—a vaccine to cut that number in half likely would result in a Nobel Prize. [T]he vaccine is still effective in about one-third of cases. “While some of the viruses spreading this season are different from what is in the vaccine, vaccination can still provide protection and might reduce severe outcomes such as hospitalization and death,” said [Darlene Foote, a representative of the CDC]. Next Next post: Is Christie Too Liberal To Win?